It must have been almost two years ago that I had seen the legendary Gordon Ramsey cook up a meatloaf for Christmas dinner, and I was really intrigued. 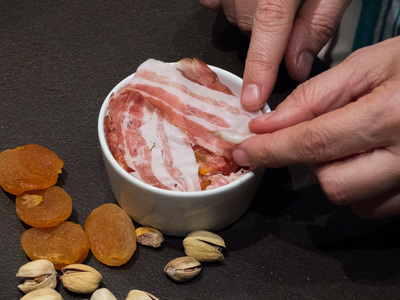 I did not write down the recipe, but remember two very intriguing ingredients he'd added to the mixture: pistachios and dried apricots. That idea went on tickling me until today, when I finally decided to experiment with this meatloaf, trying to create some kind of a hybrid between my Grandma's classic meatloaf and its English cousin. And to enrich that tiny bit I remembered of Gordon's version, I added pumpkin, sage and bacon. Well friends...my experiment turned out to be very delicious! 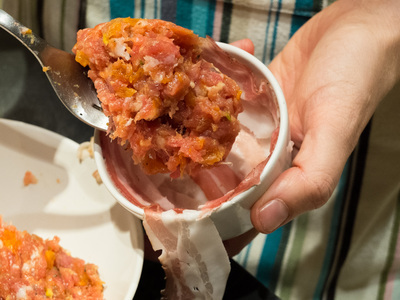 To accompany the meatloaf, I made a delightful apple compote with red wine and some roasted potatoes and beetroot. I really hope you will try this recipe as it is very simple and fast, yet totally worth trying! 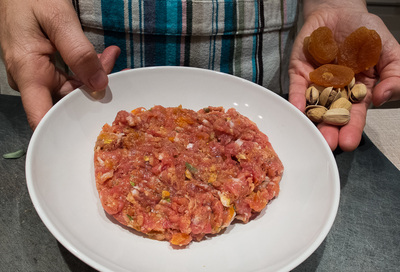 Take a large bowl and mix the two types of ground meat, a clove of minced garlic, apricots and pistachios coarsely chopped, previously baked pumpkin mashed with a fork, sage leaves cut into strips and a whole egg. Add a few drops of Worcestershire sauce, a sprinkling of black pepper and a tablespoon of semolina flour. 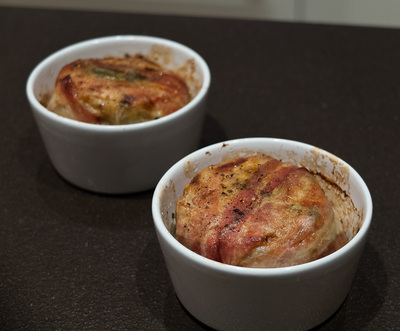 Take small, ovenproof casseroles and coat the bottom and sides with slices of thin slices of bacon. 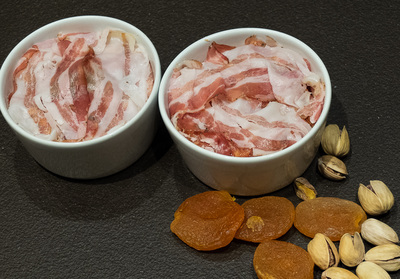 Arrange the meat mixture inside the casserole, filling it up to the edge, then wrap the top up in remaining ends of bacon slices. 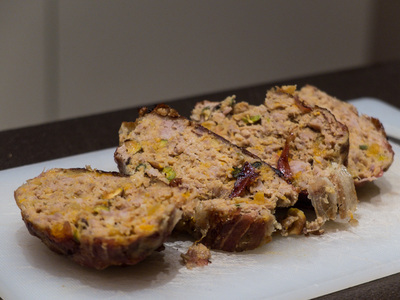 The bacon will keep the meatloaf from drying out, leaving it soft and juicy. Put to boil for at least 15-20 minutes in a tall cooking pot. Let cool down and then peel the skin off. Once cooked and peeled, cut the quinces into small pieces. Put the casseroles in a preheated oven at 180°C for 20 minutes. Finish cooking with additional 5 minutes using the grill option of your oven. That way the bacon will be golden brown and crispy, but the meatloaf inside will remain soft. 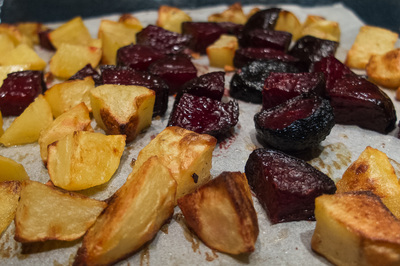 Peel the potatoes and beetroots, cut into chunks and season with olive oil, a few sprigs of rosemary, 1 clove of garlic, cut into slices and salt. Place on a baking pan and bake in oven at 200°C for about 40-45 minutes. Peel and then grate an apple (preferably a sour one). In a nonstick pan, melt a knob of butter, then add the apple and chestnut honey (or any other dark honey, as long as it's not too sweet). Blend the elements well, then sprinkle with cinnamon, mace and a pinch of salt. Let the apple caramelize well, simmering for at least 4-5 minutes, then deglaze with a glass of red wine and a few drops of apple cider vinegar. Once the wine has evaporated and the compote turns a nice claret, remove from heat. Blend the sauce with a stick blender to get a more velvety sauce. 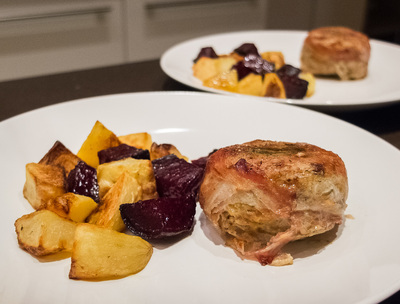 Serve the meatloaf mignon with apple compote and roasted potatoes and beetroot.